Jen's Gone Paleo: Are You Ready for Some Football!? Can be made with Ground Beef, Buffalo, or really any meat you like. 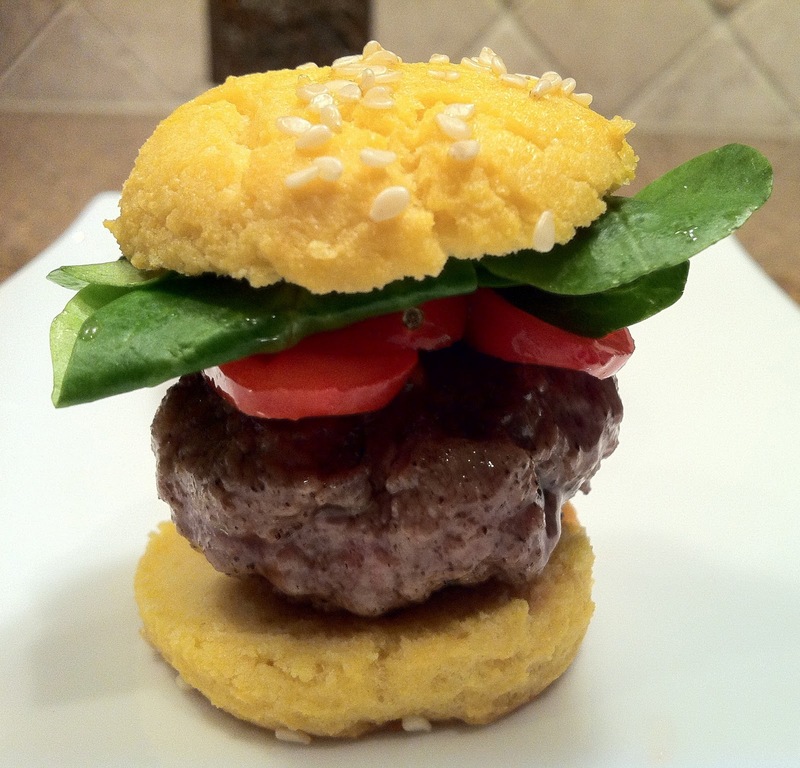 Form your burgers the day before and then bake in a 400F oven, before the party begins. Cook them to medium-rare and leave them covered with foil, until ready to serve. The buns can be made in advance (up to three days) and stored in a plastic bag until game day. Condiments can be sliced and stored in tupperware, the day before; just put them out on a platter and let your guests create their own burgers. Depending on the other items you have out, plan on about 3-5 "Sliders" per guest. 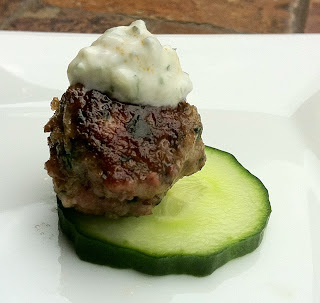 Moroccan-Style Lamb Meatballs: You can make these meatballs with any meat you like and can mix up the seasoning, as you like. These are nice because, like the burgers, they can be formed the day before and baked right before the party. You can serve them at room temperature or keep them warm in a crock pot, set on low. 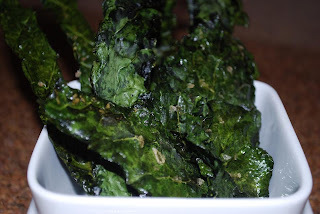 Kale Chips: These can be made a few days in advance and are just nice for their salty crunch. Make a big batch and put them out with mixed nuts. 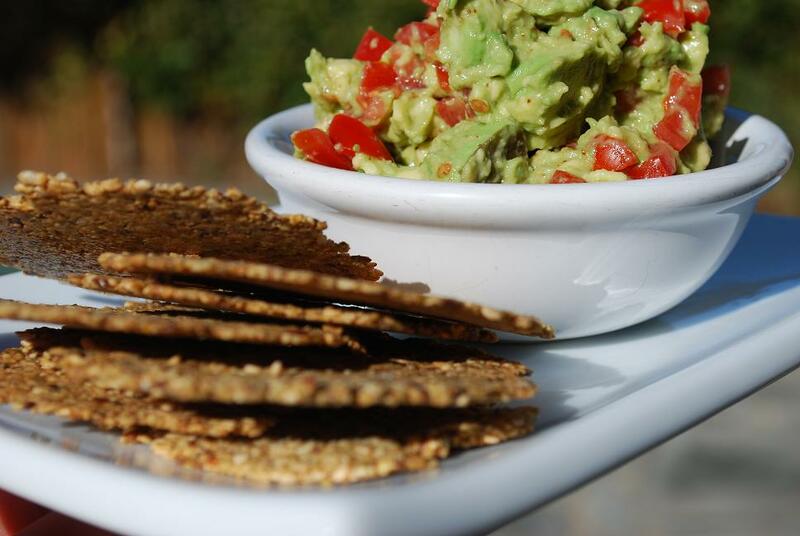 Paleo Chips and Guacamole: Sort of a must! The batter is really easy to make, but the scooping and forming can take a little more time. Make these a few days before the party and serve plated in a stack, so that they don't break. These are so good with guacamole, but would also be perfect with Baba Ganoush and/or Macadamia Nut Hummus. Macadamia Nut Hummus: Follow this recipe for Macadamia Nut "Cheese", but omit the tarragon and add 1/4 cup of toasted tahini and 1/2 T. of ground cumin. Remember that the nuts need to soak before pureeing. Serve with cut up carrots, bell peppers, jicama, and cucumber. 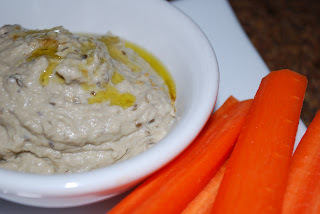 Baba Ganoush: This is a great alternative to hummus. I would make this or the Macadamia Nut Hummus, not both. Serve as suggested above. Bacon-Wrapped Dates Stuffed w/Almonds: Slice a date in half (but leave it still intact) and remove the pit. Fill the hole, that once held the pit, with a raw, unsalted almond (or 2, if large). 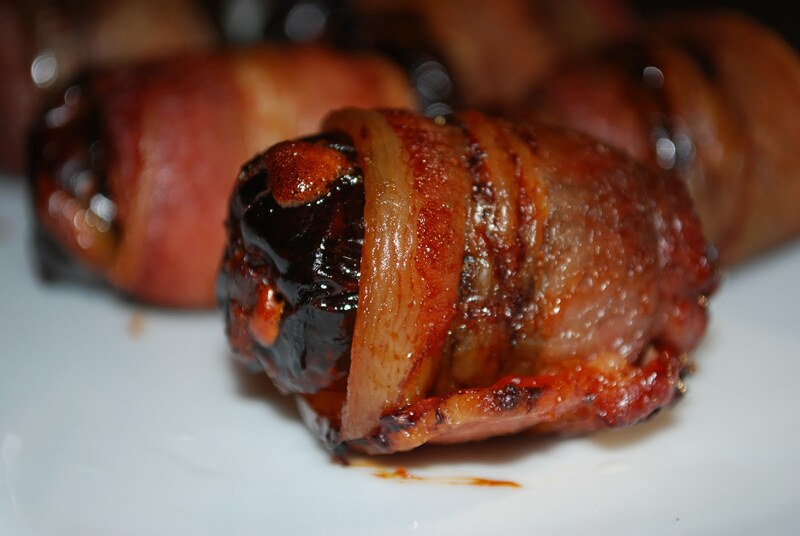 Wrap with a piece of bacon, just large enough to overlap and stab with a toothpick to fasten. Bake on a baking sheet, with a baking rack, at 415F, until the bacon has crisped, about 20 minutes. Remove the toothpicks and serve with fresh toothpicks. Our friends, John and Julia, brought these over one night and let me tell you...they are awesome!!! But, also super high in sugar so use them for these types of occasion only...not regular snacking. Sausage and Mustard: Always a hit! The thing that I've noticed, as I've slowly swooned Scott over to the Paleo lifestyle, is that sometimes it's better not to mention that the food he's about to eat is "Paleo". Putting a label on food (i.e. "healthy", "vegetarian", "Paleo", "gluten-free"...), just seems to make people feel uncomfortable. And, a Super Bowl party is not the time to make your friends feel uncomfortable. So, just make the food, let them eat (and enjoy) the food, and then wait for them to ask you for the recipe. That's the way I like to roll. Yum Yum Yum! I may make a few of these! Great post! Great stuff. I just may make a few of those and get made fun of, but at least I'll feel better the next day. Nadia~ Do you CrossFit? We're going to try to make it to a class at CrossFit Portland on Saturday or Monday. caitmanock~ Let me know if you make any of these recipes! I was a vegetarian for years...my friends and family are just glad that I'm finally eating meat! No one really makes fun of me anymore, because this change has been such a positive one for me. I do just at our local gym, but I have a friend that works out at the crossfit portland (mlk I believe), but I used to work out at crossfit clackamas! Just too much money for right now with no childcare;) So for now just wods at the gym with other classes mixed in! Nice! That's our plan, if we can't make it to a class. Last time we were up, we went to the 24-Hour FItness Super Sport...they have a little area set aside for CrossFit-style workouts. Thanks for the great Super Bowl Ideas, they all look delicious. Hi Jen, love your blog! Can you post a typical day of eats & the amounts for you? I've been following paleo and I'm not losing the weight! I'm not eating any nuts or fruit either, maybe I eat too much I dont know! I don't know what you're eating, how much you're eating, or any details related to your activity level, but it seems that more often, than not, when people (and, mostly women) switch to eating Paleo, they aren't eating enough (versus too much) protein and fat. I'll also add a page to the top of my blog named, "Eating: A Typical Day"...maybe that will help. Also, take measurements...that's usually a better indicator of change. For example, my mom started incorporating more weights (dumbbells and kettlebells) into her routine, since also switching to Paleo, and hasn't lost weight, but has lost 2" off her waistline and 1" off of her hips. Love your blog and the fantastic piks of your cooking. Delicious looking recipes - I eat too much of the same thing so will be trying some of your creations. I have a Paleo Granola on the market if you want info on how to get it. Laura Keenan of Paleo People. Are You Having Trouble FOLLOWING with the Paleo Diet?